Unlock The Secret Messages of Your Body! Your body is a receiving station for secret messages from Spirit. Stop thinking about your body, and start listening to it! The aim of Soul Coaching® is to align your inner spiritual life with your outer life. This audio series is an introduction to Letting Go – Step Into The Flow. Soul Coaching® The 28 Day Journey: Unlock the Secret Messages of Your Body. • Unlock the secret messages within, revealing truths about your body and life. body and clearing out the inner debris. • Tune into the whispers from your soul that speaks through your body. 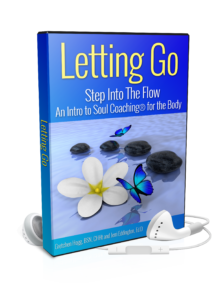 To learn more about “Letting Go – Step Into The Flow” Soul Coaching® The 28 Day Journey, click here.